This ’98 Korean made Epi has made it to the front of the class as of late. One wonders why Gibson would call such attention to their low cost Epiphone labeled jazz boxes and not expect to raise controversy with such cost discrepancy between the two brands. 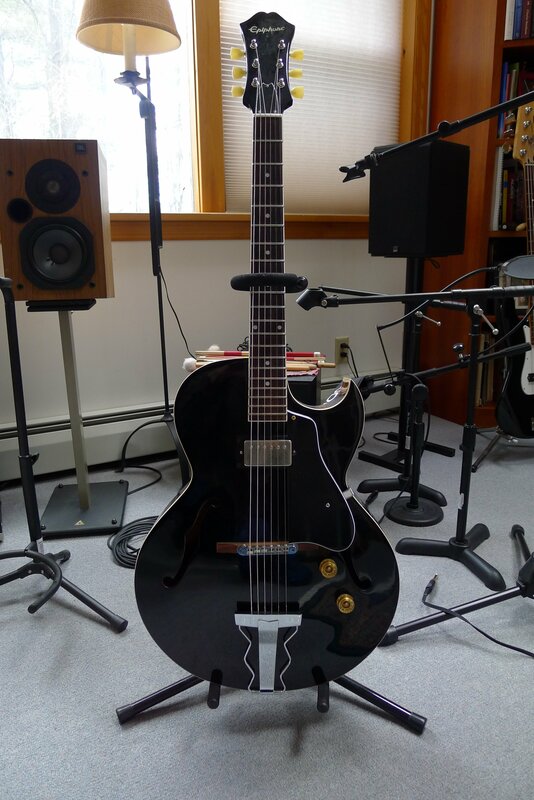 Having played and owned a few archtops in my day, including the venerable Gibson ES-175, I can honestly say that is particular guitar is beyond a bargain. I was fortunate to pick this up for twenty sawbucks and I never looked back! Also fortunate to have had the previous owner install a nice Seymour Duncan humbucker pick up and Kluson deluxe tuners for that price! How does it compare? It does very well thank you. The pickup sounds great, the neck profile is a joy to grip as well as straight as an arrow (I have yet to feel the need to tweak the truss rod) and it is built to survive a fall from the 2nd story hotel window. It looks downright dapper and …..well…Damn…just so cool. The Cons: A bit on the heavy side in weight and there is enough poly finish applied to allow it to stay out in the rain for a week and not wrinkle up like a prune! I do not know if the newer Jazz boxes from Epiphone still contain the amazing machined accuracy in their build quality but I can truly attest that this guitar was put together better than some of the high priced spreads from……………..well you know who……….